Phone - Phone line, for example, modem, ISDN, X.25. Internet - Connection Manager connection. Broadband - Broadband connections, e.g. DSL. 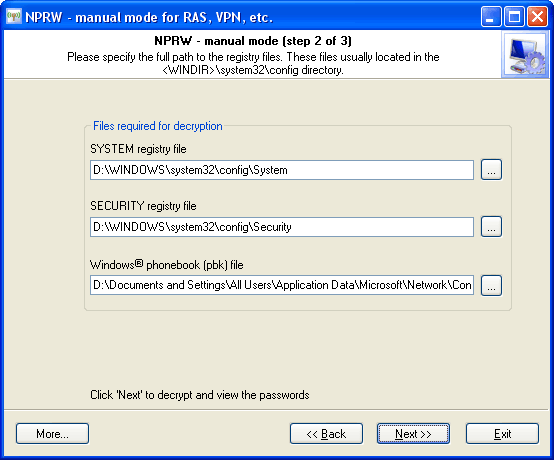 To recover network connections passwords manually, you will need to have at least two Windows registry files: SYSTEM and SECURITY. They are located in the C:\Windows\system32\config folder of your local computer. To recover the data in full, you will also need the PhoneBooK file. This file is normally stored in the folder C:\Documents and Settings\All Users\Application Data\Microsoft\Network\Connections\Pbk\rasphone.pbk. Recovering passwords without the phonebook file is also possible. In this case, only logins and passwords will be recovered, missing the connection names, phone numbers, etc.